The Electric Power Research Institute (EPRI) recently presented Wolverine Power Cooperative with a Technology Transfer Award for achievements in research and development (R&D). Brian Warner, vice president of environmental strategy and Wolverine’s representative on the project, was there to accept the award. Brian participated in a coalition of state utilities to develop a comprehensive analysis and recommendation for implementing the Clean Power Plan for Michigan—creating and advancing practical ideas to implement lower carbon strategies while maintaining competitive markets. 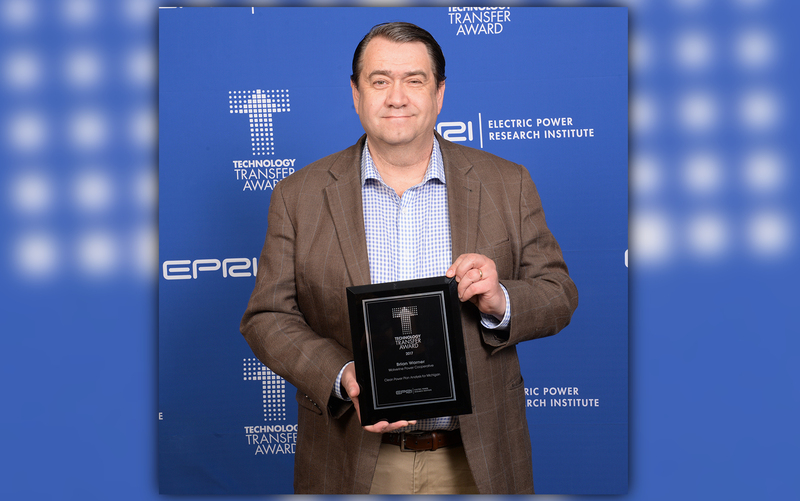 Presented annually, EPRI’s Technology Transfer Awards recognize industry leaders and innovators who help companies deliver safe, affordable, reliable, and environmentally responsible electricity through initiative, collaboration, and leadership that transform research into results in the utility industry. “The commitment and collaboration demonstrated by these individuals and teams not only benefits their companies, but the entire industry as we all have a stake in transforming and integrating the power system,” said Arshad Mansoor, senior vice president of R&D at EPRI.